I am truly a Kate DiCamillo fan. I finished Because of Winn-Dixie in one reading--I couldn't put it down. Not to gush too much, but I think this is one near perfect middle grade novel. See, I qualified my statement. I wanted to say the perfect middle grade novel, but so much depends on the reader, I don't want to put anyone off, if you have another MG novel or author you want to praise. I've known of Because of Winn Dixie for years. I found it in a middle school classroom when I was substitute teaching. I read part of it, maybe even all of it. I also saw the movie they made of the book. But then I forgot about it and continued my reading journey. Now tutoring middle school students at the library, I happily gave them the library's grade level reading recommendations. 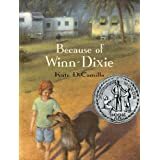 I was pleased to see Because of Winn Dixie on the reading list. I ordered it from my Digital Library, received it, and read it in one day. The way Kate DiCamillo crafted the book it's almost as if you're inside the main character, India Opal's, head. Her father is a small town and small church preacher, so she calls him "the Preacher." Right away Opal tells us they've moved to a new small town and she's lonely, missing her old friends. The book is about that summer they first moved to Naomi, Florida. Opal tells us everything that happened that summer started when she found her dog, Winn Dixie. He helps her make friends and gives her the love and companionship she needs. The story is heartrending and heartwarming. It's told in the voice of a lonely ten year old, who's not only missing her friends from her old town, but also her mother who left when Opal was three. The story has everything that I love, a strong main character plus the other characters are memorable, too. They're real, human, and they each have their own stories. Opal collects them all, to tell her father and maybe to share with her mother, if she returns. The story doesn't have major crises, or obstacles or impossible situations for the main character to overcome. It's just life has pain and sadness and yet it has love, beauty, friendship, and hope. That's what I love most about Kate DiCamillo's books--they are true to life, all of life, and they give me hope. I trust you'll enjoy this along with her other books and I'm on the list for The Tiger Rising and The Magician's Elephant. 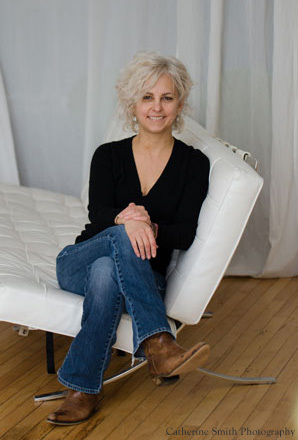 Thank you Kate DiCamillo, our National Ambassador for Young People's Literature. I look forward to all your books for us middle grade readers. i have been looking for an easier way for the little ones to start their reading habit as it comes really handy in further life and builds charecter. amazing work Anne. please keep writing! Kate is a very good story writer for kids. There are very few writers who are writing for kids. To write for kids one must be imaginative.